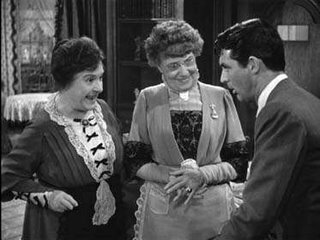 “Arsenic and Old Lace” is, from my point of view, one of the funniest comedies of all time. The film's screenplay was written the Epstein brothers based on Joseph Kesselring's successful Broadway play of the same name. But let’s begin with the plot... Mortimer Brewster (Cary Grant), a drama critic who was educated by two sweet but eccentric old aunts, has just got married and is about to go on his honeymoon when he discovers insanity runs in his family, which also includes one brother who thinks he's the USA President Teddy Roosevelt and another who is a psycho-killer fashioned after Boris Karloff. A very dark and funny sitcom of a much more innocent times: in 1944, the idea of respectful people committing murder was funny in it's own way because it was a situation so far removed from reality. "Arsenic And Old Lace", however, is anything but sad! And what about the performances? All of them were wonderful, but Cary Grant's facial expressions and hilarious body language are just out of this world!. In spite of the fact that Cary Grant always disliked his performance in “Arsenic and Old Lace” (he complained taking part into a comedy film) I think he was excellent and it is impossible not to laugh your head off. - Mortimer: But there's a body in the window seat!!! - Abby: Yes, dear. We know. - Abby: Yes, but it has nothing to do with Teddy. - Abby: Now Mortimer, you forget about it. Forget you ever saw the gentleman. - Abby: We never dreamed you'd peek. Ah! The Spanish traslation is a little bit different, as you can see if you visit this old link on my blog (http://cineblog.blogia.com/2006/042801-arsenico-por-compasion.-frank-capra-1944.php#comentarios). My final advice? If you haven't seen this movie already, what are you waiting for?.